The Korean conductor and pianist Myung-Wung Chung whom we were supposed to see conducting at the Berliner Pilharmoniker on the 19th of October was replaced by the young Kristjan Järvi. This last minute change reminded me of a somewhat funny legend that dwells among the members of this orchestra. Whenever a new conductor is invited to conduct the Philharmoniker, if the orchestra happens to dislike the conductor’s musical ideas, then the Concertmaster (first violin) allegedly lifts his left shoulder as a signal for the orchestra members to disregard the suggestions given by the conductor and play according to Karajan’s sketches. 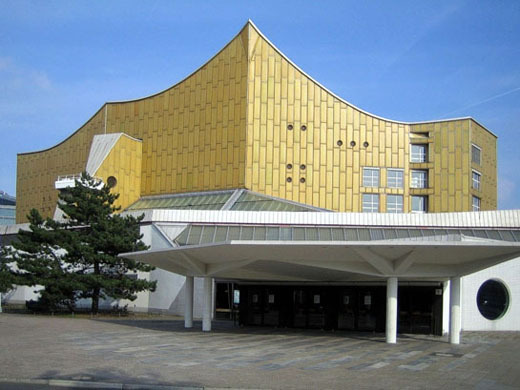 But although for Kristjan Järvi this was a debut performance with the Berliner Philharmoniker, the shoulder appeared as unnecessary. Moreover, the members of the orchestra are not only successful in their solo careers, but they are also good at cooperating and work perfectly well together. Certainly, these are the preconditions which guarantee a high quality of interpretation, no matter who is conducting. The concert consisted of two parts. The first piece in the first part to be played was Carl Nielsen’s En Fantasirejse til Færøerne (An Imaginary Trip to Faroe Islands). The end of this composition left huge impressions on me, mainly because there’s nothing spectacular about it, just a prolonged note of a single clarinet with a decrescendo. The note lasted for a very long period of time, in an unbelievably controlled so-called ‘perfect decrescendo’ towards an almost inaudible pianissimo which melted into complete silence. The moment produced was inimitable! It was amazing to see how a simple idea of a composer can be craftily transformed into a magical moment. L’Ascension of Oliver Messiaen followed, full of unusual combinations of instruments that created a great variety of sound nuances. The cohesion of this orchestra made the choral-like sections a truly spiritual experience. The piece ended in the high octaves of the strings, creating an atmosphere which remained faithful to the ascension, not to mention that it remained truthful to the title itself Prayer of Christ ascending towards his Father. The second part of the concert was reserved for the audience’s favorite – Tchaikovsky’s Forth Symphony. The powerful beginning of this symphony involves Beethoven’s idea from his Fifth Symphony – the fate knocking! Tchaikovsky uses the horns to do ‘the knocking’ and the famous horn section of the Berliner Philharmoniker really knocked it. The first movement of the symphony brought the best out of the entire wind section, with moments so powerful that our seats were shaking. Second movement theme was played beautifully by the horn player Dominik Wollenweber, followed by the cellos with just the right vibrato, until all the strings join with their melancholic theme that leads to other sections. The conductor passionately insisted in bringing up the bass lines, in order to make it more ‘Russian’ sounding, coming from the cold winters. Third movement was a very joyful scherzo, during which the string players leave their bows and play pizzicato (plucking with fingers, like a guitar). Winds takes over with a very pastoral theme in the middle section until the strings recapitulate with their pizzicato. The forth movement was very explosive and powerful, with virtuosic scales and loud repeated chords throughout the movement. At the very end of the movement the orchestra was taking a crescendo huge to the point where I thought there was no more and then another Berliner Philharmoniker magic happened – the timpanist took another crescendo which enabled us to experience the best ending of this symphony one can ever imagine.